Each year, on the 1st day of Sleeping, a Choosing Ceremony is held. It's the biggest event of the year; almost all of Neopia attends. Only those who have recently turned the age of 16 can participate. The Choosing Ceremony is the most significant event in a young Neopian's existence. It's the crucial moment in their life when they are painted their color of choice. Immediately following the ceremony, the newly painted Neopet must face the real world with designated jobs that are unique for each color. There's no going back. Up until the Choosing Ceremony, a Neopet is one of the four main colors: red, yellow, blue or green. Upon making their Decision, the Neopet takes on a new identity-and they can never return to their old life. I turned 16 on the 11th day of Storing. Tomorrow, I will participate in the Choosing Ceremony. "Are you nervous?" Shia asks me. "I can't sleep, if that tells you anything." I whisper. I shift in bed so that I'm facing my twin Usul sister. She decided to sleep in my room tonight, and I was more than willing to let her. I have a vague feeling that all of our fellow peers are not sleeping well tonight either. "What if we make the wrong decision?" Shia's back is to me, but I can practically see her worried gaze. "Don't worry, sis. As long as we stay together and stick to the plan, we're fine." This seems to reassure my beloved sister, because her breathing starts becoming heavier and steadier. I pull the covers up over my head in attempt to drown out my own thoughts. Thinking about The Ceremony makes my heart beat a mile a minute. I try to focus on Shia's steady breathing, and eventually start to feel myself drift off into a light slumber. Morning comes all too quickly. Before I know it, I am standing in front of a mirror, Shia right next to me. Our mother is behind me, tying a perfectly crisp red bow on my tail. Using a Blue Daisy Brush, I attempt to comb my fur into something at least half decent. I definitely didn't get my beauty sleep last night. "You look gorgeous, Gia." My mother turns me around so that I'm facing her. She beams at me with her beautiful brown eyes. My mother was one of the more fortunate Neopets. The day of her ceremony, she became very ill, which hindered her ability to attend. All 16 year old Neopians that are unable to attend their ceremony must make a visit to the Secret Laboratory the day they are healed from their illness. On the 4th Day of Sleeping, my mother met the Mad Lab Ray Scientist. No one knows what happened during her time at the Lab, not even us. All we know was that she came out of the Lab two hours later, sporting her new Chocolate coat. Her peer, who was sick on the day of the Ceremony as well, went to the Lab the same day as her. The poor thing came out Mutant, the color he had previously mentioned he wanted least. "Thank you, Mom," I say, and hug her tightly. "Are we ready?" Shia asks. I look over at her and nod. She, too, is wearing a red bow. We've matched our attire since the day we knew what clothing was. After The Ceremony today, we will have the same color coat. "Let's do this!" I say, and we saunter out of our house. Feeling an overwhelming sense of nostalgia, I try to take in my surroundings. Today will be the last day I live on Ghoul Close, Haunted Woods. Tomorrow I'll live somewhere new and potentially far away from my parents. Thankfully, I'll still have my sister. Neopia Central is flooding with Neopians. They're everywhere, overflowing the streets. Shia and I walk paw-in-paw. Our mutual friend, Cappa, bounces his way towards us upon our arrival. "Hey guys! Excited for today?" he asks happily. I laugh. Cappa is the most jovial Bruce I'd ever had the pleasure of meeting. Even though I'm not sure of a lot things that are about to happen, one thing I am sure of is that Cappa will remain a life long friend. "We're excited! A little nervous, too..." Shia replies, embracing him tightly. "No need to be! You'll make the right decision," he responds, patting her on the back. Shia simply nods. "Well, we should probably go find our seats. We don't want the Faeries to count us absent." We push our way through the massive crowds. The Choosing Ceremony is held in the center of Neopia Central, on the steps of the Rainbow Fountain. It's normally a beautiful backdrop, but today it almost seems menacing. We take our assigned seats. Cappa is a couple rows ahead of us, which means he'll make his Decision before we do. I'm nervous to see what he chooses. A high-pitched ringing of bells soon surrounds us. It's the official sound of the commencing of The Ceremony. "Good morning all, and welcome to the three hundred and twenty second annual Choosing Ceremony!" The always-elegant Fountain Faerie is perched over the side of the Fountain, her sweet voice looming over the crowd. Everyone hushes. Just the sight of the elusive Fountain Faerie could quiet up even the most talkative Neopet. "Today, we are celebrating the class of Y14. These ambitious students will be making their Decision today. Upon doing so, they will then have the opportunity to become a fully independent Neopian citizen. They will have the ability to live on their own and make their own Neopoints. In regard to all of my fellow faeries and everyone in Neopia, we wish you all luck in your Decision!" The crowd goes wild. Everyone sitting next to me is clapping their paws exuberantly, and I eventually end up joining them. Shia's the only one who sits completely still. "We welcome Mufura from Faerieland to the Fountain!" the Fountain Faerie exclaims. I watch as Mufura, the yellow Wocky, makes her way to the Fountain. She doesn't seem nervous at all. I envy her. "Wise choice, young one. Please take a step into the Fountain." Mufura does as she is told. The Fountain Faerie says something to her that only she can hear, and Mufura is dipped into the water. The Fountain fills with sparkles as bells ring and within the split of a second, Mufura is a transformed Neopet. She steps out of the water elegantly, showing off her new Pirate coat. I smile. Anyone can tell that she was made for that color. Cappa was within the first five Decider's. He chooses Cloud. I'm happy for him. That's the perfect color for his optimistic personality. There are 726 Neopians in the class of Y14, the biggest class yet. The Transformations before me seem to drag on, but before I know it Sparrow, the green Ixi right before me, has his turn. He chooses Grey. 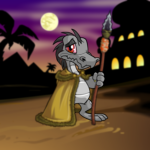 I'm not surprised, he was always a more independent Neopet. "We welcome Gia from Haunted Woods to the Fountain!" My heart leaps when the Fountain Faerie says my name. I stand up from seat, adjust my bow, and make my way towards the rainbow water. Shia squeezes my paw, which gives me just enough reassurance. "Young Gia, I have always heard fabulous things about you. I cannot wait to see what your future has in store for you. What is your Decision?" She smiles at me. Is it possible for someone to be as beautiful as her? "My Decision is Faerie." I smile back at her. She nods. "That's exactly what I was thinking," she says, only to me. This makes my heart leap. Being in her presence was magical. I step into the Fountain. The lukewarm water surrounds me, but it doesn't soak my fur. Instead, it feels like stepping into a pile of clouds. I can't see anything except for an assortment of beautiful colors. I hear the bells, but it's hard to comprehend what exactly is happening. I just feel giddy all over. Before I know it, the Fountain Faerie is helping me step out of the Fountain. "You make a beautiful Faerie, young Gia." I beam. I flutter my new green wings, showing them off for the whole crowd to see. I know that this was the right decision for me. I fly my way back to my seat. Everyone congratulates me as I flutter past them. I thank them all, feeling the happiest I've ever been. "You look amazing, sis." Shia gives me a huge hug when I return. She looks me up and down. "I'll never look as beautiful as you," she says. I poke her in the side jokingly. "You're my twin, Shia! Of course you will!" I say, and embrace her in a tight hug. "We welcome Shia from Haunted Woods to the Fountain!" Shia trembles in my arms. She steps back and looks up at the Fountain nervously. "I can't do it," she whispers. "Of course you can. Everything will be okay." I push her a little bit, and she makes her way up to the Fountain. "Shia, you are one of the smartest Neopians in your class. I cannot wait to see what you become. What is your Decision?" There's a long pause. The crowd hushes. My heart starts beating quicker. Say it, Shia. Say Faerie! "My decision is Darigan!" There's a loud gasp throughout the crowd. My mouth drops open. There has to be a mistake. Shia did not just say Darigan. Before I could interject, my sister steps into the Fountain. This is no mistake. Shia had no plans at all to stick to our plan. She had no intentions to become a Faerie Neopet. Why wouldn't she tell me? A couple minutes later, my transformed sister is making her way towards me, her head hung low. She sits down without saying a word. My heart sinks. All of our friends are staring at us, seeing how we will react. It's not very common for twins to choose different colors; however, once they realize we weren't going to say anything, The Ceremony continued. After two long, dragged-out hours, The Ceremony ends. Every year there's a feast held after The Ceremony. We all sit around the Fountain with our new looks and reminisce with our family and friends. I grab a bowl of faerie hoops and sit down next to Cappa. "Cloud is the most fitting color for you, Caps. You look spectacular," I say. "Thanks Gia. You look perfect as well. Have you talked to your sister at all?" he asks. I shake my head. It's killing me inside not talking to her. "Well, speaking of, she's coming here right now. Her new look is so intimidating!" He laughs and stands up from his seat, "I'll leave you two alone," he says. I mouth thank you to him. "Please don't hate me." Shia sets her plate down at the table. I look at her sadly. "I could never hate you, and you know that. But why didn't you tell me? We've been planning to choose the same color since we were five! I feel like you betrayed me," I say quietly. Shia's face droops even lower. "My intention was not to betray you, Gia. Up until a couple of nights ago, I had every intention to choose Faerie. But when I actually sat down by myself and thought about it, I knew that's not what was right for me. Darigan is who I am. It's who I've always been. I wouldn't have been happy being Faerie." "You could have told me that! Then I would have chosen Darigan!" I exclaim. A tear rolls down my fur, onto my pink mane. "No, Gia. You wouldn't have made the right decision choosing Darigan. That's not who you are. Faerie is perfect for you. That's why I didn't tell you. I didn't want you to base your opinion off mine. Sometimes, G, we have to do things on our own. You're my twin and my best friend, and it'll always remain that way. But this is what's right. We need to explore the world by ourselves, you know?" As much as I hate to admit it, I know that Shia is right. We've always depended so much on each other, and it was time we branched out and became our own Neopians. "I'm being selfish, that's all. I'm just going to miss you, S. I'll be living in Faerieland and you'll be in Darigan Citadel. That's a far distance," I say. Shia laughs. "Mom lives in Haunted Woods and Aunt Anti lives in Maraqua. They make it work! They see each other as much as possible. We'll be fine, Gia. Like you always tell me, everything will be alright." Shia hugs me tightly. "You're the best, Shia." I hug her back. "You too, sis. Just remember, Gia, that everything will work out in the end. And if it isn't working out, it isn't the end."